After you record a macro in Excel 2013, you can run it by clicking the View Macros option on the Macros button’s drop-down menu on the View tab, the Macros button on the Developer tab of the Ribbon, or by pressing Alt+F8 to open the Macro dialog box. As you can see, Excel lists the names of all the macros in the current workbook and in your Personal Macro Workbook (provided you’ve created one) in the Macro Name list box. Simply click the name of the macro that you want to run and then click the Run button or press Enter to play back all its commands. If you assigned a shortcut keystroke to the macro, you don’t have to bother opening the Macro dialog box to run the macro: Simply press Ctrl plus the letter key or Ctrl+Shift plus the letter key that you assigned and Excel immediately plays back all the commands that you recorded. 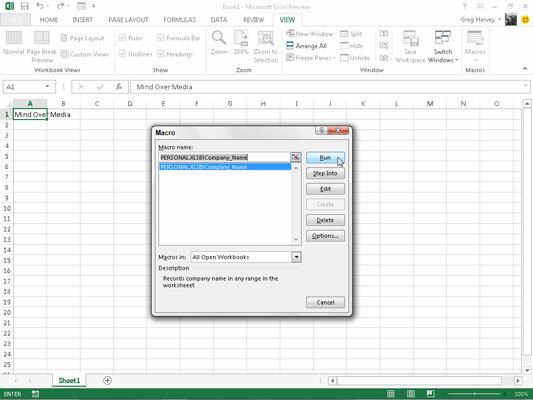 The reason that macros you record in the Personal Macro Workbook are always available in any Excel workbook is because the PERSONAL.XLSB workbook is also open — you just don’t know it because Excel hides this workbook immediately after opening it each time you launch the program. As a result, if you try to edit or delete a macro in the Macro dialog box saved in the Personal Macro Workbook, Excel displays an alert dialog box telling you that you can’t edit a hidden workbook. To unhide the Personal Macro Workbook, first clear the alert dialog box and close the Macro dialog box; then click the Unhide button on the View tab (Alt+WU) and click the OK button in the Unhide dialog box while PERSONAL.XLSB is selected. Excel then makes the Personal Macro Workbook active, and you can open the Macro dialog box and edit or delete any macros you’ve saved in it. After you finish, close the Macro dialog box and then click the Hide button on the View tab (or press Alt+WH) to hide the Personal Macro Workbook once more.